Take your seat at the $100,000 Pyramid slot machine by IGT based on the American television game show that originally debuted in 1973! This iteration takes you through 5-reels and 15-paylines of fun and hitting the right combinations can even save your place in the Winner's Circle Bonus feature! Take your seat at The $100,000 Pyramid slot machine by IGT based on the American television game show that originally debuted in 1973! This iteration takes you through 5-reels and 15-paylines of fun and hitting the right combinations can even save your place in the Winner’s Circle Bonus feature! If you’re a fan of the game show you’ll notice immediately the familiar sound from the television series. Symbols on the reels also stay true to theme with things like the game’s logo, The Winner’s Circle symbol, Mystery 7, Celebrity Star, Gold Bars, Contestants and traditional playing card values of 10 through ace. The graphics are retro looking which is fitting for a slot based on a television show that first aired in the 70’s! Winner’s Circle Bonus -Land three or more of the Winner’s Circle bonus symbols to activate this bonus feature. You’ll will get a pyramid that you must attempt to climb to its highest point to find your free spins and multiplier reward. To start you’ll get 2 free spins with a 1x multiplier and each of your 5 free picks on the pyramid could earn you even more. 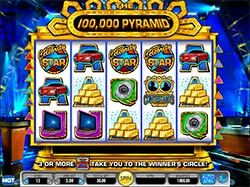 Wild Symbols – The $100,000 Pyramid game logo is the wild and substitutes for all symbols except the Winners Circle symbol trigger, to complete winning combinations when possible.